Buffet servers, sometimes referred to as chafing dishes, offer a way to keep prepared foods warm and ready-to-serve for guests in your home or business. Some have heating surfaces that double as standalone warming trays like the Oster buffet server, while more disposable buffet server kits like the Party Essentials buffet serving kit, use methanol gas fuel cans that burn for 2 hours apiece to keep the food warm. The 10.8 lb., Oster is our top pick- It is a stainless steel buffet server that features three 2 1/2 quart buffet pans and a 20" x 13" controllable heating surface. It will allow you to keep up to three different styles of dish warm and prepared to serve- with transparent lids that trap in moisture and heat. You will need to plug it in, using its 3 foot long power cord, so it's not ideal if you are hosting a wedding reception outside, for example, in which case the Party Essentials chafing kit would be a better option. That said, its users love it- with many of them writing that they use it for a variety of entertainment purposes, that it kept the food hot without drying it out (it should be noted that the food has to be hot prior to putting it in the serving pan, otherwise it takes forever to heat up), had really big serving pans that are dishwasher safe, and was surprisingly durable. Look: let's take a look at five of the best-selling buffet servers on the market today and see how they compare. This eleven pound, Oster CKSTBSTW00 Stainless Steel Buffet Server is a good buffet server with three 2 ½ quart serving trays with lids. Customers love how handy this server is when it comes to serving a lot of guests, but it does not have an on and off switch so when it is plugged in you should make sure you have it at the temperature that you want. The Oster Buffet Server comes with a variable heat control and the pans are all dishwasher safe. The Oster also has a warming tray that is twenty inches by thirteen inches and can be used separately. One customer that bought it in 2012 said that they liked it but were afraid because the covers were light and could possibly crack. They then went on to update a year later and two years later and said that it still works good and the lids are fine. Multiple people said that they had problems with it on arrival and that it smoked from the power knob. Those who did not personally experience the smoking malfunction, mentioned that the unit does not have a spot for ladles or spoons. Also the bottom of the unit tends to heat up so you have to be careful of what you put it on. This is an okay option if you are looking for something, with a mid price range, to use at a big party or in a function hall. This nine pound, Party Essentials 33 Piece Party Serving Kit with Chafing Kits and Serving Utensils is a great serving kit that includes thirty three disposable utensils such as serving spoons/forks and more. Users loved how well it worked for big parties such as birthdays and graduations. Along with the utensils the UPK-33 also comes with six gel-fuel, aluminum cans that you can put under the trays that will help keep your food warm for about two hours apiece. 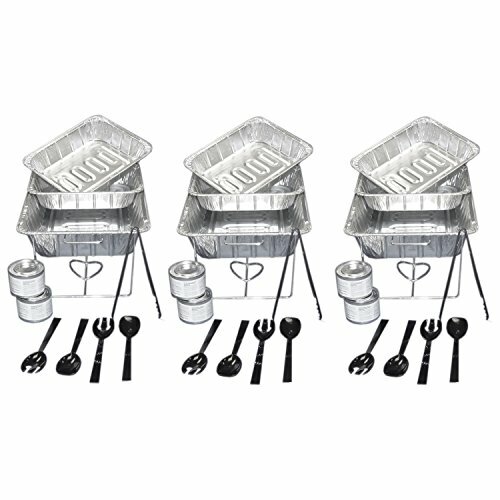 The Party Serving Kit also comes with three racks, three aluminum water pans, and six aluminum serving pans. One user bought it for a graduation party of about one hundred people and was happy with both the price and the quality. They go on to say that they question if the serving trays could hold up with heavy food but it worked for what they had, and kept the food warm. Most of the complaints people had with the Party Essentials UPK-33 mention how flimsy the pans were and that they came in a little deformed and bent for some of the purchasers. This party serving kit is great for those who are looking to serve big groups and keep the food warm. This sixteen pound, MaxiMatic Elite Platinum 3-Tray 2-1/2-Quart Buffet Server is a great buffet server that has an adjustable temperature control. Users love how easy it is to use and how well it worked. Be warned, however that you have to be careful with the lids. Some customers claimed that the lids actually cracked from the heat. The MaxiMatic come with three twenty five quart serving trays and three clear dome lids. The lids have a cutout for the spoon/fork handle to stick out of so it can still close. One customer that really like the EWM-6171 said that the covers lasted a year before they finally had to replace them, and though it was on the pricey side they said the customer service was good. Another customer mentioned how easy it is to clean the buffet trays and that the food did not stick to it. Some of the purchasers also mention that it either didn’t get hot enough for them or that it took too long to heat up. But the majority of buyers seem to stick by the MaxiMatic saying that it looks nice and that they like the adjustable heat. This buffet server is a quality serving tray if you are looking to keep food warm to serve for a lot of people. 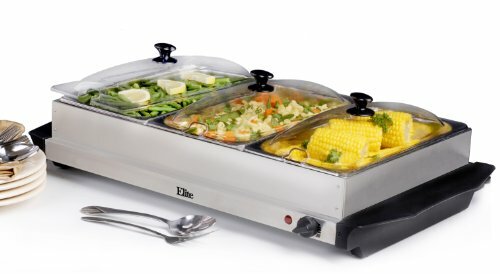 This eight pound, Nostalgia Electrics 3-Section Buffet and Warming Tray is a questionable party serving tray with a stainless steel base that doubles as a warming tray. Users like how much food it can hold and keep warm, but the edges are a thin metal and can be sharp. The Nostalgia comes with adjustable heat control and the lids have slots that the handles of your utensils can stick out of. The BCD-992 has three 2.5 quart serving trays and the base doubles as a warming tray. One user shared a picture of a burned and cracked countertop saying that the Buffet and Warming Tray was responsible for this. Many others complain about how sharp the edges are of the trays are and a few said they cut themselves cleaning it. The buyers that liked the Nostalgia talked about how well it kept their food warm and how much they liked the adjustable heat option. One of the customers that like this warming tray advised to hand wash the lids as opposed to using the dishwasher. This buffet warmer is a poor choice if you are looking for a quality and safe way to feed a bunch of guests. This 11.3 pound, Winware 8 Qt Stainless Steel Full Size Chafer is a great serving tray with one full size food pan that has two hooks to hold the cover in place. Users like how nice the Chafer looks and how well it works for the price, but it is lightweight and possibly can be a little flimsy. The Winware comes with a stainless steel mirrored look that helps give this product a more high quality look to it. The Chafer comes with dripless water pan, that is suggested to put in about 1 ½ to 2 quart of water. It also comes with a dome lid and two fuel holders underneath to keep the food warm. One of the purchasers of the Winware Chafer liked that it was well constructed and that the lid fit the pan right, they also mentioned that the hooks would not hold the lids at all for them. The majority of the buyers are really happy with the quality of the product for the price that it cost, but more than a few people mentioned how it does not have a recommendation for how much water to put in the water tray. This serving chafer is a good quality and inexpensive option if you are looking for a single pan serving tray for keeping food warm for a gathering. In most traditional restaurants, individuals will order food from a menu and have it delivered to their table- with the restaurant controlling how large or small the portion size is. This enables restaurants, diners, lounges, bars and gastropubs the ability to maximize the profit per plate. Buffets, on the other hand, are a form of self-service dining in which the customer will pay the restaurant a fixed fee and then they are allowed to pile on as much food as they want to their plate. The waitstaff and servers may refill the beverages and clean up around the diners, but generally the waitstaff have a lesser role in a buffet restaurant situation than in a traditional one. A lot of times a buffet style dining experience consists of a long serving line that includes hot and cold foods- with a variety of smaller-sized stations that are designed to appeal to particular meals. Like, for instance, a salad station, a deli meat section, a desert stand and a station dedicated to fresh vegetables. Many people attribute the all-you-can-eat buffet to the Swedish tradition of smorgasbord, which literally means "sandwich table". Outdoor buffets often work well in conjunction with outdoor waste receptacles. The modern buffet is a bit different than the smorgasbord, because the smorgasbord was a bit more limited- mainly focusing on cold, fish-oriented appetizers, a variety of different sandwiches, different meat dishes and then ultimately a dessert. Buffets really originated in Las Vegas, Nevada, where casino owners wanted to maximize the volume of food they could serve, but also wanted to minimize the number of expensive staff that they retained to service their restaurant patrons. 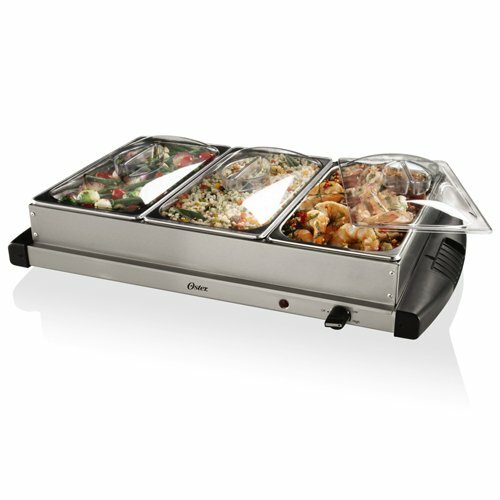 Buffet servers are an important element of the buffet experience- they are an ideal way to keep prepared foods warm and available to serve, trapping in heat and moisture, while also presenting an attractive experience to diners. In the case of Las Vegas and its gamblers, maintaining a buffet was a wise decision because it kept gamblers inside the casino and also attracted outside patrons to the food and also to potentially gamble. Over time, buffet-style restaurants have become popular dining experiences for restaurant owners as well as diners. 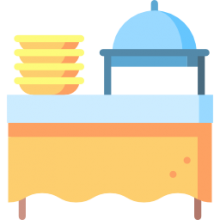 Often times a buffet-style restaurant will purchase much of its food from different types of middlemen or wholesalers who can purchase it at discount- and then serve the food to the diners at a cost that is acceptable for the consumer and is profitable for the business owner. Buffet servers, and disposable chafing dishes, are ideal options if you are looking to keep foods like chicken wings, raviolis, bacon wrapped delicacies, meatballs and other hot foods warm and ready to eat. 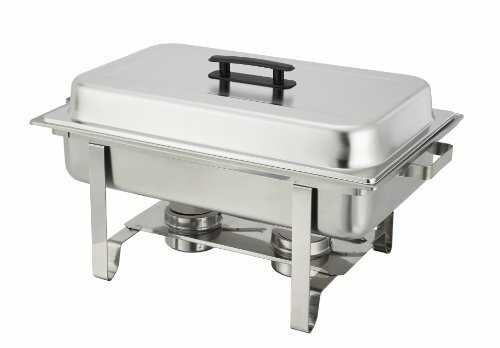 The stainless-steel buffet servers are generally pretty easy to clean up after, but if you're looking for a disposable chafing dish you can purchase those too- and just toss them into the garbage once the party is done.